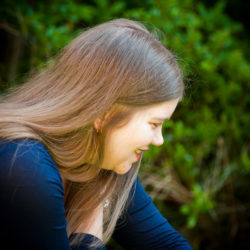 Elise Edmonds is a new writer from the South-West UK. Reading and writing have always been her doorways into another world—a way to escape and spend time walking with wizards, flying with fairies and dealing with dragons. By day she is a finance professional, and in her spare time she pursues writing as a creative outlet, to put the magic back into everyday life. In addition to reading, Elise enjoys watching movies, playing the piano, and going to Zumba classes. Her greatest loves are God, her husband, her family and friends, and her two beautiful cats. 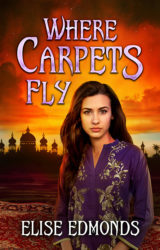 She has currently published one young adult fantasy novel, Where Carpets Fly. Now… on to the six questions! If you have any questions of your own, please leave them in the comments, and hopefully Elise will drop by and answer them. I’ve always loved learning new things and challenging myself. My other main achievements have been in my day job. In total, I’ve done an additional five years of study post-university, whilst working a full-time job. I have completed both the Chartered Accountancy exams and the Chartered Tax exams in the UK. The tax exams are considered to be some of the most difficult professional exams you can do, so it was definitely a huge sense of achievement to gain that qualification. Unfortunately, I’ve reached the end of the road with study in my day job, as further qualifications would involve either too much academic work or a narrow field of study – neither of which is relevant to my current job. In terms of the effort involved, the work I put into my novels is similar – constantly learning, revising, and improving myself, and squeezing it into evenings and weekends! Oh, I’ve always wanted to write a book. I’ve been writing on and off since I was a kid. Until a few years ago though, I’d never managed to finish a novel. Every now and again I’d pick up my latest project and have a go at it, and then eventually decide it was rubbish and give up on writing for a while. I repeated this cycle until about three years ago when I found an online critique website and got the encouragement and feedback I needed to finally complete a novel. And this time, I won’t be putting it down again! I feel like my writing process itself is still a work in progress, as I’ve only drafted two complete novels from start to finish (Where Carpets Fly, and the sequel in progress). At the moment, I favour writing an outline, roughly based on a three-act structure, then getting the outline critiqued, followed by writing the first draft. That first draft is not fit for anyone else to see, and I then make notes on it in spreadsheet form, followed by writing a second draft for critique. My essential tools are my laptop, smartphone, Word and Excel. Oh, and Evernote for any other notes I need to take. I keep all my writing in the cloud (Dropbox) because then it’s easy to sync between different devices – very handy as I’m out and about a lot of the time. I’m one of these people who watches films of books and criticises every time something in the film does not agree with what’s in the book! I think what I hate the most is when characters don’t look like I imagined them in my head. For example, Lucy in the most recent Narnia books is dark haired, and I think she should be blonde. It bugs me every time I see one of the movies! Young adult fantasy is one of my favourite genres, and I’d love to see the Septimus Heap series by Angie Sage made into movies. I believe it was on the cards at one point, but nothing ever came of it, unfortunately. They would be great films, though. Providing, of course, that the movie matched the books exactly and everyone looked like I imagined them to! 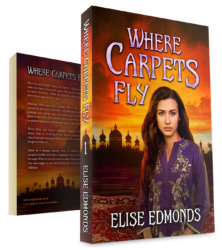 If you like a fun-filled story with magic, flying carpets, and adventure, Where Carpets Fly is the book for you. Fourteen-year-old Elina goes to live in the city to take magic lessons, but uncovers a mystery about a neighbouring country. An unexpected journey leads to disaster for one of her friends, and Elina has to use her wits and newfound magic skills to head up an epic rescue mission. Thanks for having me, Jay!